Team Arrow tries to catch Star City’s newest Vigilante, a killer who is targeting criminals and leaving them dead. Thea tries to help Lance when he comes to her with an unsettling secret, and in the past Konstantin Kovar tells Oliver that he does not know which side he is really on. 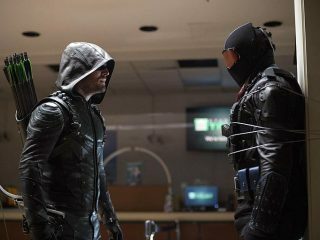 When the bodies of two criminals are dropped at SCPD, Oliver (Stephen Amell) realizes there is a new Vigilante in Star City. The team is split about whether they should stop someone who is helping keep the city safe. Diggle (David Ramsey) is frustrated with his new situation and Thea (Willa Holland) fights for Lance (Paul Blackthorne) who confesses a shocking secret. Meanwhile, in the flashbacks, Oliver finally sits down with Konstantin Kovar (guest star Dolph Lundgren) (#507).